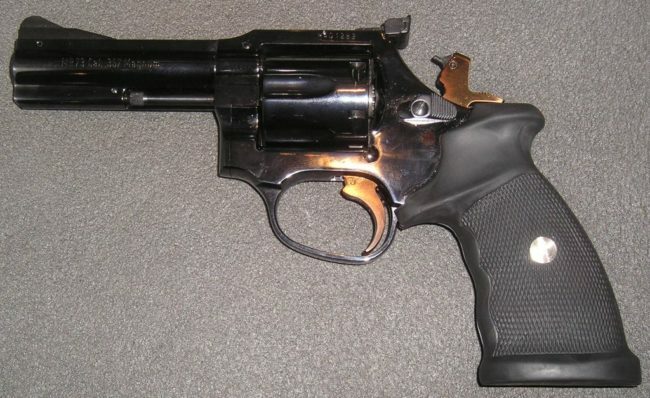 MR-73 revolver was developed by the French company MANURHIN in 1973. This revolver is a standard issue firearm of the French Gendarmerie, as well as some of France’s most elite law enforcement agencies- (G.I.G.N., R.A.I.D. etc). This revolver is also a favorite European sporting arm, available in Sport and Match (.32 S&W Long or .38 Spl). Presently MR-73 revolver is produced in France by Chapius Armes. All MR-73’s feature all-steel construction, designed to withstand extreme pressures. Barrels are manufactured by ‘Cold-Hammering’, which resulted in long service life and extreme accuracy. Additional cylinders for 9x19mm Luger ammunition were available as options, providing the ability to use cheaper ammunition for extensive training. All MR-73’s have hand-assembled and ajusted actions, resulting in very good to extremely high accuracy and also a high unit price. The reliability and service life of this revolver, combined with match-grade accuracy, also brings it into the “Worlds’ best service handguns class”, along with SIG P-210.